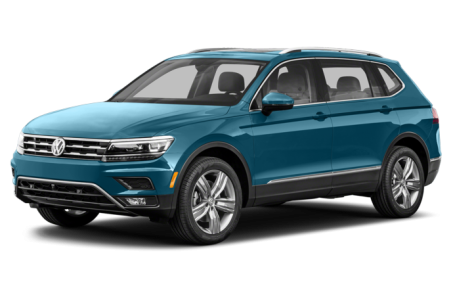 It's been a long time coming, but a redesigned 2018 Volkswagen Tiguan has landed in the U.S. at the 2017 North American International Auto Show in Detroit. The Volkswagen Tiguan compact SUV is overdue for a freshening and it arrives in a big way. Bigger, in fact, than the European version that's already on sale. The U.S.-market Tiguan comes with an extended wheelbase compared with the overseas version and the extra length makes room for an available third row. The 2018 version measures 185.2 inches long, 10.7 inches longer than the outgoing Tiguan. It's similar in size to the Nissan Rogue (184.5 inches) and Kia Sorento (187.4 inches) and they also have available third rows. Volkswagen maintains there's a little edge built into the Tiguan with a 26-degree approach angle for off-roading. The Tiguan's interior design is nearly identical to the GTE Active Concept and the European Tiguan. The extra wheelbase and length are good for up to 57 percent more cargo room than the current model. The second row slides fore/aft 7 inches and folds in a 40/20/40 split. Third-row seating is standard on front-wheel-drive models and optional on all-wheel-drive versions. Volkswagen's Digital Cockpit is an available reconfigurable instrument display that can show navigation information between the traditional speedometer and tachometer gauges. Keeping up with the technology theme is standard mobile integration for Apple CarPlay and Android Auto, which mirror navigation, phone and streaming music to the VW's multimedia display. Optional equipment includes heated front seats, heated steering wheel, foot-activated power tailgate and panoramic sunroof. Power comes from a turbocharged 2.0-liter four-cylinder engine making 184 horsepower and 221 pounds-feet of torque, which pairs with an eight-speed automatic transmission. Front-wheel drive is standard, and Volkswagen's 4Motion with Active Control all-wheel drive with four driver-selectable modes for on- and off-road driving is optional. 13 of 13 (100%) consumers said they would recommend this vehicle to a friend.